Each morning I go outside with a cup of hot water and walk barefoot through the grass to a little hill facing the woods behind my home. In the bright morning light and fresh air, I talk with the Lord. One morning I heard a noise in the undergrowth in front of me. Curious and a bit concerned in case it was a snake, I watched. The grass indicated something was moving in my direction. 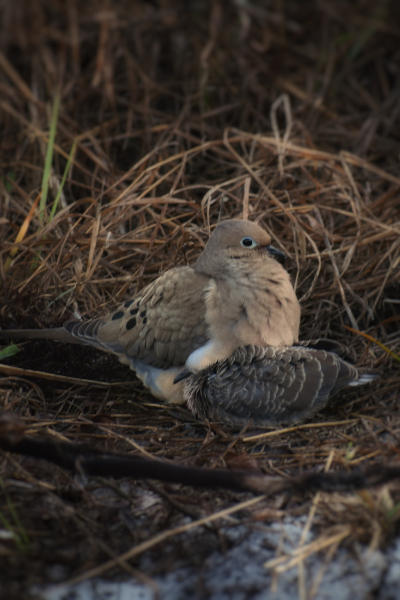 Then a mama dove appeared, followed slowly by her chick. That week I had been digging up a vine whose roots went deep into the ground so I could plant some fruit trees. As a result, there was a trench like hole, with a little mountain of dirt beside it. Mama stopped beside the hole and rested. Junior came up, nudged her, and worked very hard trying to fit himself under her. The problem was, he was no longer small enough. He didn’t fit. That didn’t matter to him. He knew where his safety was – underneath mama. Patiently she remained still as he worked to hide himself under her feathers. She took her time ascending the little hill, then rested at the top, where Junior could see her. When he didn’t come, she slowly descended until she was about 6 feet on the other side. Junior acted confused. She had left him all alone! He looked all around but couldn’t see her. Why had she left him? If he wanted to be with her, he had to leave his comfort zone and move into the unknown. Timidly he began to climb, gazing all about as he nervously kept me in his sight. He momentarily rested, jumped up, and courageously ascended. As he crested the top of his huge mountain, his nervousness was replaced by joy. There was Mama! But she didn’t move, she waited, resting peacefully by the cactus a couple feet in front of the stranger. Junior had to make another decision. To get closer to Mama meant he had to get closer to the strange creature watching him. He hesitated. Looked back to where he had been comfortable with his mother. The way up the hill had been gentle and safe. But the descent to Mama was steep and felt dangerous. As if trying to gather courage, he put off the inevitable and scratched in the dirt. After a while, he looked back at Mama. She hadn’t budged an inch. It was obvious if he wanted to be with her, he would have to be the one who moved. When he finally reached her, he happily nudged her and tried to get underneath her. She moved away, not cooperating with him. He didn’t give up but tried again. Without success. She moved further away, pecked in the dirt, and then turned towards him. Finally getting his attention, she began shoving her beak into his upturned mouth. He had thought she didn’t care about his need to nestle, to hide, and to feel safe. The truth was his mother wasn’t interested in his comfort. She chose to leave him so he would follow and she could feed him. Once he had eaten, she allowed him to settle beside her – with some of her feathers fluffed over him. She was in no hurry to go anywhere, neither was he. They sat quietly. Safe with his mama, Junior was now unconcerned by my presence. When I returned to the house, I was encouraged. And then it hit me. The wonderful drama played out before me of a chick trying to rest beneath his mother’s feathers is exactly what the Lord calls you and me to do. As a shepherd boy, David learned to trust the Lord. There in the field, watching over his sheep, he would rest under the Lord’s shadow, trusting the Lord to be his refuge and fortress. David paints a lovely picture of the Lord being like a mother bird, who watches over you. He will rescue you from the trap and from the deadly plague. Like a mother bird, He covers you with his feathers and shelters you under His wings. The wonderful thing is you can’t grow too big to find shelter under the Heavenly Father’s wings. But it is your choice if you do take shelter under His wing! I urge you, be like Junior who wanted to be with his mama and wasn’t content unless he was in her presence. But there was a catch. Junior’s mother knew what was best for him. She wanted him to learn to follow and she wanted to feed him. Junior just wanted to be comfortable. And so she left him – exposed. He had to make the decision to trust her, to follow her, and then to stop striving and allow her to feed him. The solution is simple. Have you learned to trust the Lord even when He doesn’t give you what you want or think you need? The Lord is wise. His plan doesn’t always feel good. 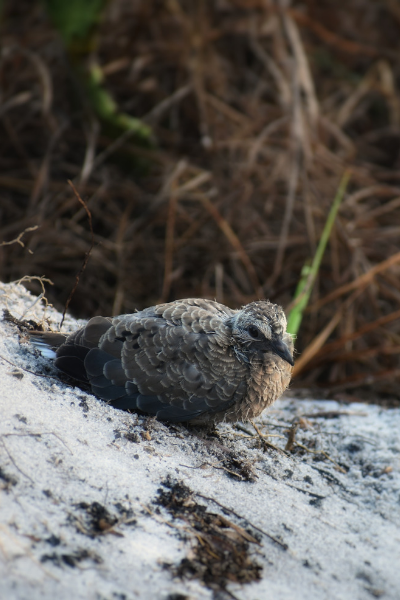 But just like the mama dove, He gives you just what you need. But what does that mean? Junior wasn’t satisfied unless he was near Mama. Are you like him? Did you know there is something more wonderful than being near the Lord? Let me explain. Junior was near his mom but he also had to learn to follow her and to cease striving. As he did, he was fed. Even as he choose to take shelter under his Mama’s feathers, you have the opportunity to come to rest in the Lord’s presence. If you trust the Lord, choose to be still in His presence, He will cover you so you rest under the safety of His wing. My dear friend, I urge you to learn from Junior. 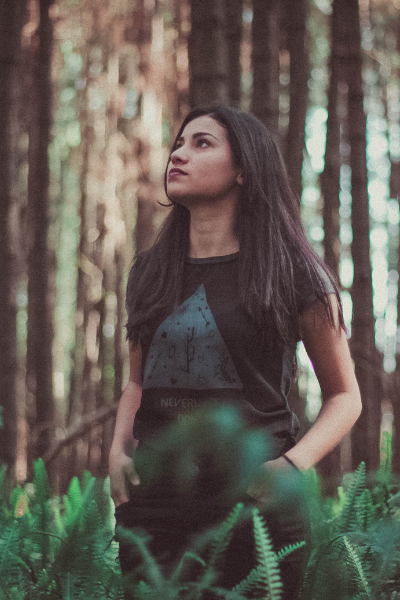 In the midst of the perplexity of life – take shelter under the Heavenly Father. Cease striving. Let go of your demands and your need to self-protect. Learn to rest in the Lord’s presence. Allow Him to cover you, to nurture you, and to fill you with His precious Holy Spirit. If you’d like to read more about these birds and why it’s so hard to rest in God, I encourage you to go here. Barbara,that is a nice message. Thank you, Ted. I think you would have enjoyed watching the birds. Truly God’s creation is wonderful. I love the lessons He teaches me through nature. Wishing you every blessing and may you become skilled at resting under our Father’s wing.